The explosion in advanced mobile computing linked to integrated applications running on cloud and collaboration platforms has fundamentally changed consumer life. It has enabled us to see more, compare better, adapt more quickly and feel closer to the things we need or love. As consumer expectations change, so consumers bring these expectations into business. Clients, workers and value chains are all amplifying their capability with new technologies, and critical markets are being disrupted by ambitious start-ups. This can be seen in the graphic opposite. When clients have their expectations amplified by the mobile economy, they find it hard to understand situations in which they can no longer see real-time performance information linked to personalised communications. They are used to being able to compare offers from multiple suppliers with the click of a button and having the flexibility to choose products and services with the tap of a finger. When employees have their expectations similarly amplified, the constraints of a corporate IT infrastructure lead to frustrations in simple tasks like visualising, processing and sharing information. The different look and feel of critical business applications like SAP, Oracle, Dynamics and Salesforce, linked to the lack of easy cross-platform data management, clashes with the simple single sign-on capability of multiple cloud platforms. This often results in employees breaking company security policies to use more dynamic mobile technology, leading to a challenging relationship between corporate IT and the end user. Often, this results in restrictive controls on employees’ personal devices that reduce the benefits of mobile technology rather than amplifying it. 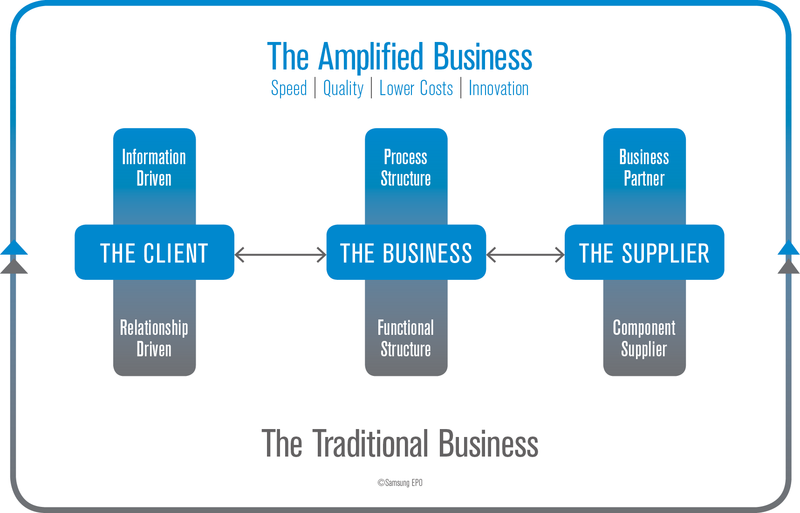 Suppliers, when engaged by an amplified business, see their position change from being cost items to being an integral part of the client engagement and marketing experience. This shift results in stronger strategic relationships, replacing tactical purchasing decisions with data aggregation, combined analytics and cooperation, providing the ability to enter new markets or disrupt existing markets. Perhaps the best example of the combination of all three areas is Uber. The traditional taxi model has remained unchanged for many years, with providers looking to differentiate in the business or supplier layer. As consumers got more used to mobile technology with location capabilities, operators appeared offering location-based services. This allowed users to be specific and selective about what they wanted and where they wanted it. This was combined with the fact that every driver in the area was able to be located and had a permanent connection to many data services, including online commerce platforms. Uber’s disruption built an agile business model that linked the client to the supplier through advanced software, location-based analytics and advanced payment platforms. Driving this level of change across multiple global markets would have been impossible without the amplification of client, business and supplier digital services. For the print market, the indicators are all pointing toward a similar disruption point. A decline in use and rapid change in user behaviour, driven by mobile and digital services, has left businesses with a desire to see a new way to buy and use print. The response from suppliers is to provide cost efficiencies that relate to the cost of the paper, effectively stalling the potential disruption that needs to occur to better serve print users today. Responding to these changes requires a new perspective and a different approach, one which Samsung is uniquely positioned to provide. Enabling people to view and use information through Samsung devices means the entire work environment can be connected, from mobile phones to large format displays. Samsung is now able to offer previously mobile-only capabilities on its MFD technology. The integration of an Android controller enables users to have the intuitive experience that they have come to expect, with the ability to print and scan content seamlessly. This shift in thinking challenges the current approach that many print vendors are taking with the creation of bespoke print workflows, controlled by expensive imaging and management software. For most businesses, this approach is taken on top of any existing investment that has been made to enable simple and secure mobile device use. Our leading range of print technology products has been named ‘Range of the Year’ by Buyers Lab International, an award that gives consumers confidence that the infrastructure used to print is the fastest, easiest, most reliable and best value on the market today. This is now further supported by a single, global support model that provides services in over 160 countries, with standard SLAs and pricing. Our new MultiXpress products support video feedback, with real-time links to a service expert, while technicians get access to an expert system with device cloning directly from their mobiles. 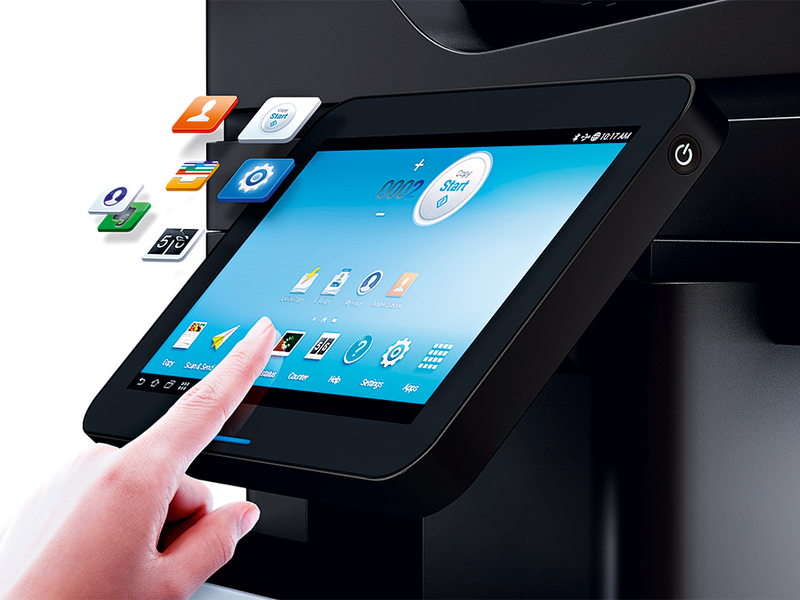 Samsung, as a founding member of the Mopria Alliance, is looking to change access to print and scan services with simple ‘tap to print’ NFC and BLE integration, allowing users to complete jobs with no knowledge or understanding of drivers, queues or applications. In addition, with the acquisition of PrinterOn, Samsung now has the largest public printing service, giving users the power to print and scan documents even when they are out of the workplace. Unlike many vendors, Samsung believes an open approach to paper digitisation will yield the best results. The adoption of mobile operating systems on Samsung MFDs enables access to the existing mobile services and application platforms most businesses have in place for digital-to-digital transactions. With a suite of open APIs to access key paper capabilities like printing and scanning, incorporating paper into the mobile workflow now takes days rather than months. Considering all the above, the need for robust security to protect the network and the information being used is essential. Samsung Knox provides a platform for all on-device software and data to be protected via hardware encryption. In addition, Knox offers full persona support, enabling a device to operate in a secure mode based on the user login. This allows access to key applications and data on the MFD to be restricted, ensuring things like scan-to-email, faxes and other items are locked for secure environments. Knox also protects the network by stopping an attack on the device operating system itself. Alerts will be generated when an attack occurs and denial-of-service initiated automatically for a compromised device. Obviously, these features are in addition to the normal image overwrite, network encryption and firewalls that are in place on Samsung and other MFD platforms. The final step of linking all of this through a new commercial model is perhaps the most important and the hardest stage of the process. Samsung’s unique position in mobile, display and compute platforms means that a full view of how users and consumers will interact with data can be built. This removes the preconception that paper volume decline is bad for the print supplier and empowers the business to choose the right platform for cost and usability without worrying about other contract agreements. Upgrading print is the only solution, but this means open systems, mobile-first thinking and service models that offer advanced end-user support. Samsung is leading this change with its Android-enabled MultiXpress devices, MPS services and partners selling the entire Samsung range, from mobile to print. The next two years will be telling, but businesses that adopt the above approach will see benefits in cost and productivity that were not available before.